Since we had gone out quite late for dinner, “Jim” was waiting on all of the few tables in our section that were occupied. Next to our table was a group of Somalians. These folks were eating their dinner when my wife and I were seated. After these folks at the next table were done with their meal and post dinner coffees, they started taking pictures by an open booth on the other side of us. As my wife could see them while they were taking pictures, she asked if they would like her to take a picture for them so that all of them could be in said picture. One of the women in the group was pregnant, and her compatriots were teasing her, telling her that she couldn’t be in the pictures, only be the photographer of them because she was “ugly”. This commentary was all said with smiles and my wife retorted to them that their companion was not ugly at all, in fact their companion was beautiful. Much more banter was exchanged, and the pregnant woman came over to our table and gave my wife a big hug to thank her for her “beautiful” comment. After the group of Somalians leave, we have further interaction with “Jim”, during which we find out that he also works at a restaurant at the Mall of America. Since the ‘Black Lives Matter” rally had occurred at MOA just a few days before, my wife asks him if she can ask him a few questions in regards to his views about the “Black Lives Matter” rally. 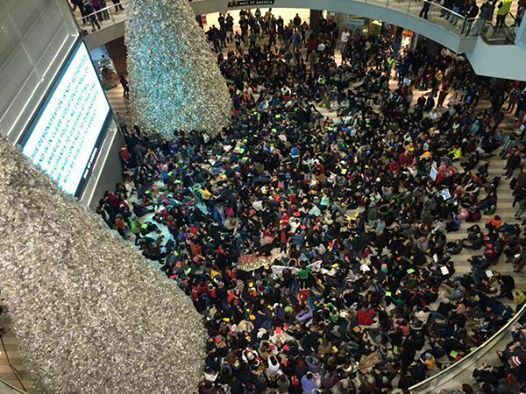 Over 3000 protesters gathered in the Mall of America in support of the BlackLivesMatter movement. Image via Facebook. This is when the conversation took a very unexpected turn. “Jim’s” belief is that the protesters at MOA scarred the general populace that was there only to exercise their right to consumerism, and that the “Africans” (Jim’s terminology) had used the unrest that had sparked the protests to try to further their own agenda, an agenda that “Jim” did not understand, nor did he think that the Mall of America was where these “African’s” should have been protesting. I was taken aback by “Jim’s” reference to “African’s”, when the majority of the protesters that i saw were not even of African American decent. The only “African’s” that I could see this young man having ANY actual interaction with were the Somalians that he had been waiting on a bit earlier in the evening. I found it disheartening to see that someone who expects others to be open-minded about his lifestyle could be so intolerant and un-informed about others viewpoints and the world around him. Perhaps the conversations about why #BlackLivesMatter needs to be prefaced by the reasons that we ALL need to be more AWARE and more TOLERANT of our fellow humans, whether we meet them in a mall or in a restaurant. This entry was posted in Civil Rights, Demonstrations & Protests, Human Spirit, Media Issues, Social Justice, Solidarity and tagged BlackLivesMatter, Democracy, Intolerance, Mall of America, Protests on December 26, 2014 by MNgranny.